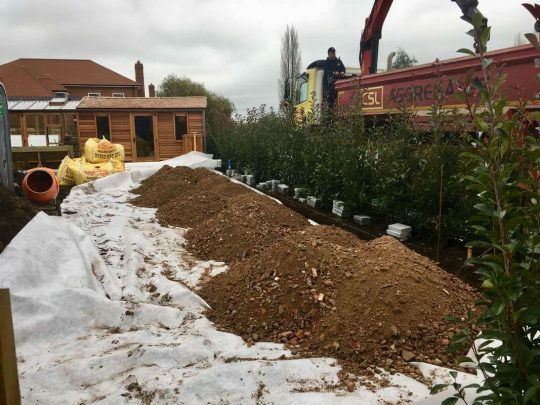 Our client recently bought his stunning house in Froyle and asked Buds to design and fully landscape the frontage and rear garden. 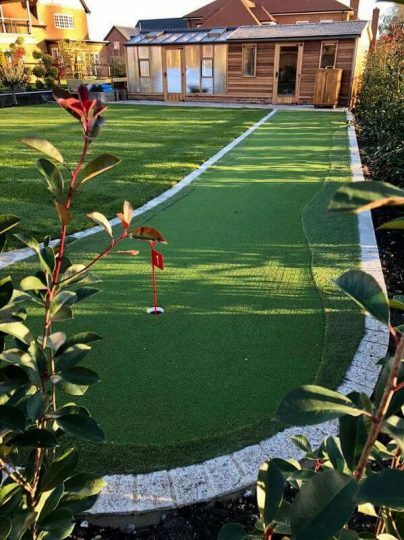 This was a fantastic project to be part of and the Namgrass Pro-Putt Green was the perfect finishing touch. 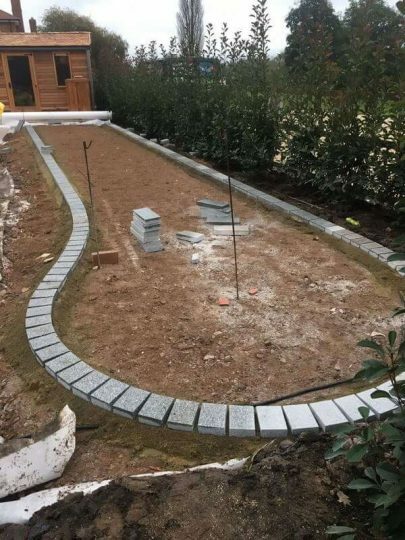 Rear Artificial Lawn with Filcris edging. Our client has young children and looks after dogs on a daily basis, so her Lawn was very patch and uneven. She asked us to fit an artificial lawn but keep the slightly hexagonal shape to her lawn / borders. We did just that any she and the dogs are delighted with the results. 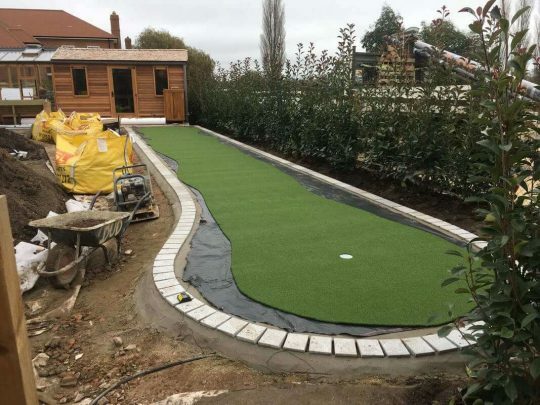 Artificial Lawn Circles and Paving laid with edging, plus Shed base. Our client has recently moved into her new home in Hartley Wintney. It’s a beautiful house, but came with a very small basic patio area. 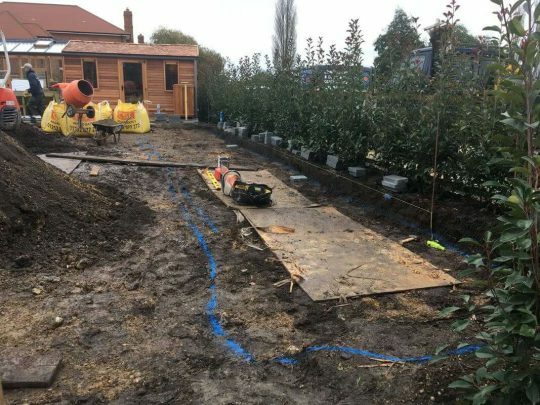 She struggles to maintain a garden and had seen photos of a low maintenance project that we completed the year before that she liked the look of. We managed to recreate the look on a slightly smaller scale and she was very pleased with it. 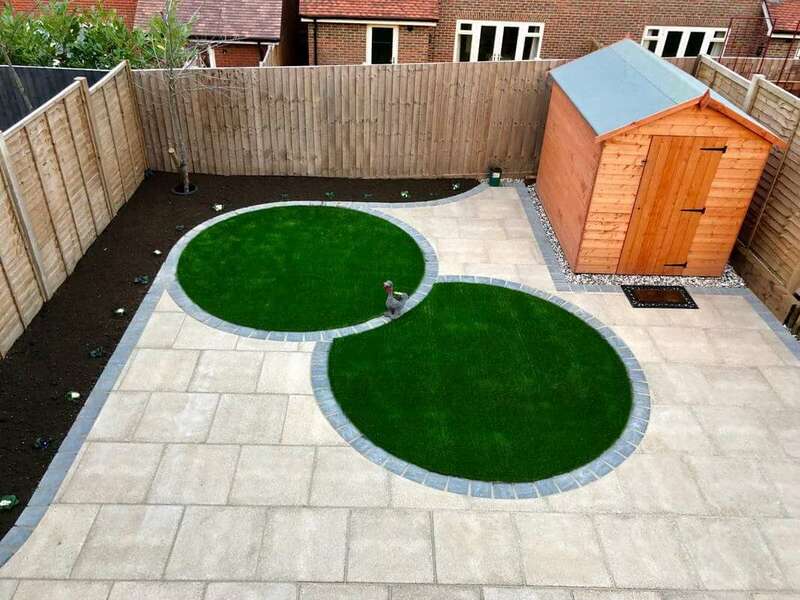 The circular artificial lawn sections contrast perfectly with the buff coloured slabs and grey edging. Small Artificial area in front of Children’s Playhouse. 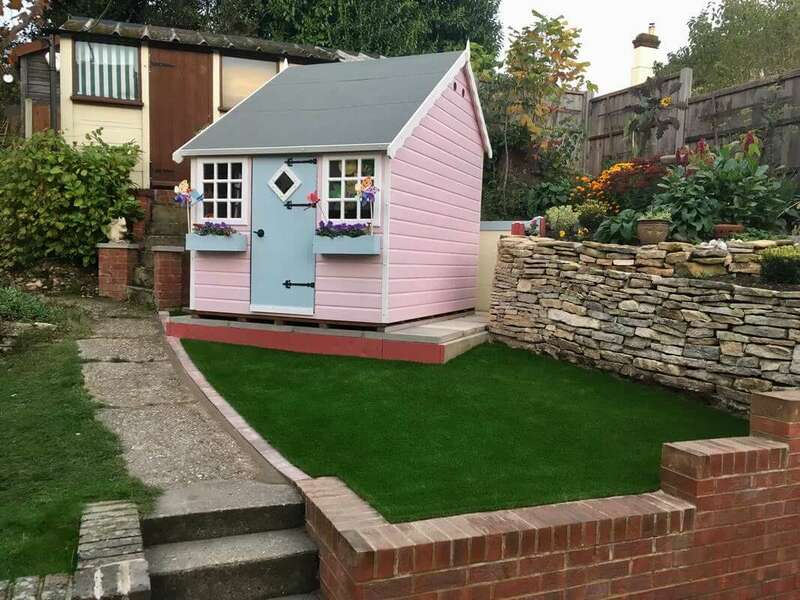 Having just completed his granddaughters playhouse, our client asked us to fit a small section of artificial lawn to provide a safe area for her to play when she visited. 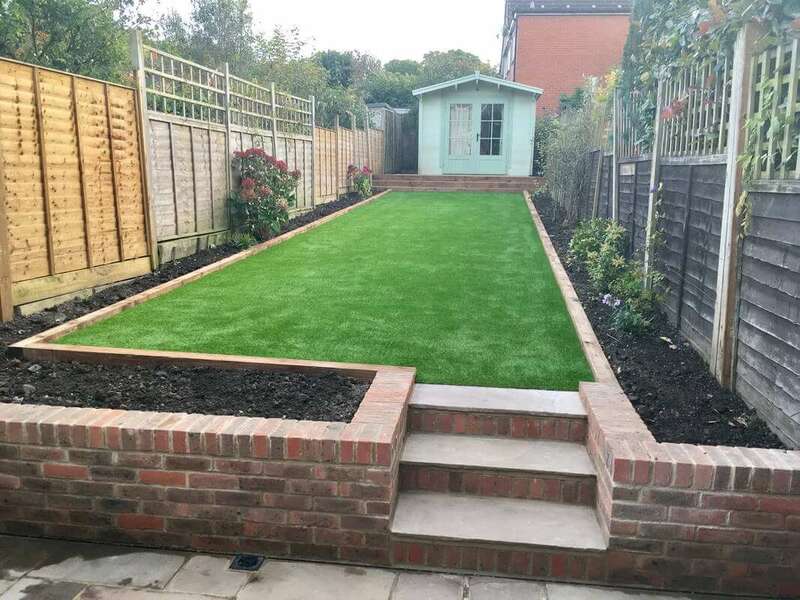 Artificial Lawn, new brick wall with Sandstone paved steps and Pickett fence, plus Sleeper boarders and rear Sleeper framed steps with Breedon Gravel terrace and infill. 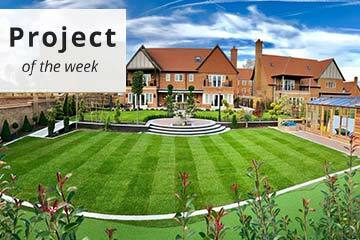 Our client was referred to us by a friend who was delighted with her Artificial Lawn in Hindhead. She asked us to flatten her lawn, build a new retaining wall with sandstone steps to match the existing patio. 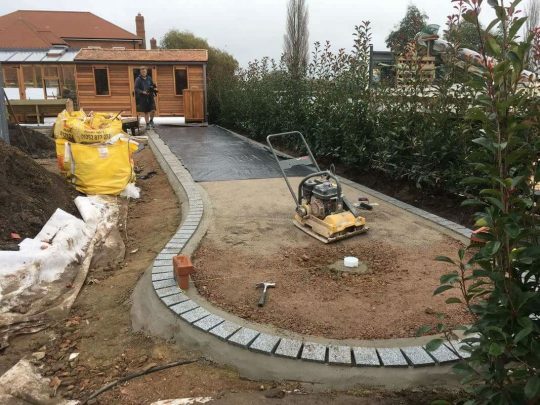 We then fitted Sleeper framed rear steps and side boarders, with a Breedon gravel area around their Summer house and Breedon step infills. Finally we added a long Namgrass Eclipse Lawn to complete the look. She and her family are delighted. 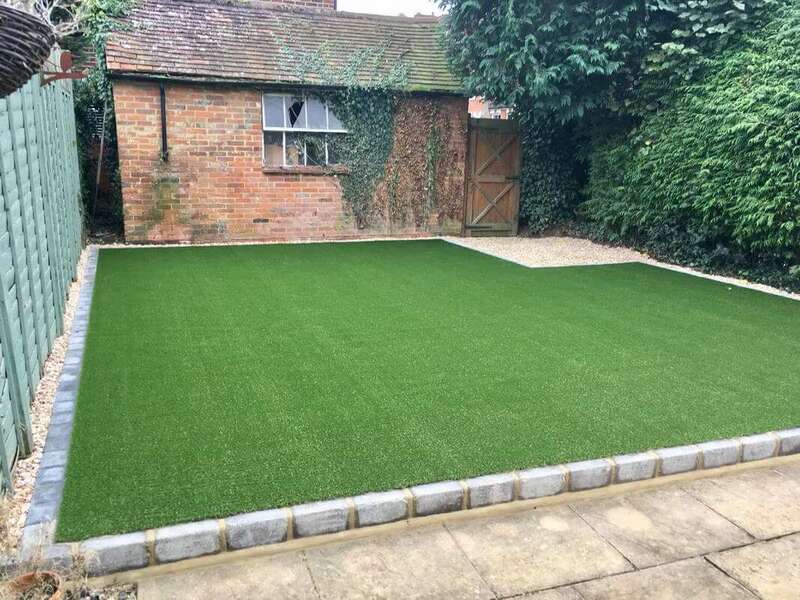 Artificial Lawn fitted in Courtyard. 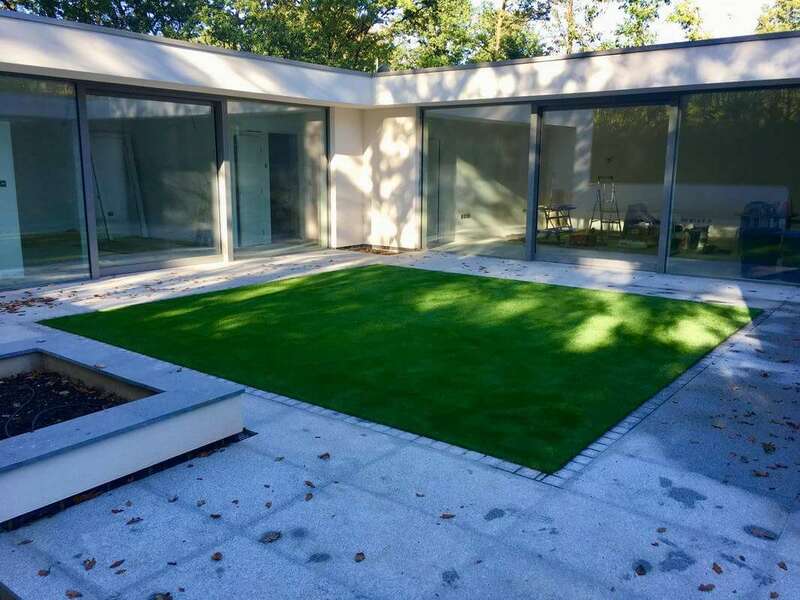 Our client was coming to the end of his stylish, modern bungalow build and asked us to drop in a fresh new B2B35 Artificial Lawn to complete the look. 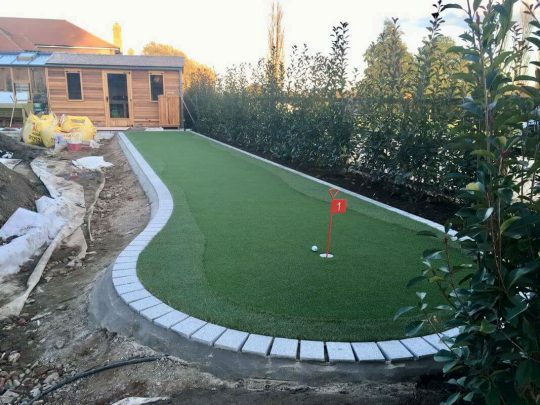 Rear Artificial Lawn with Block edge. 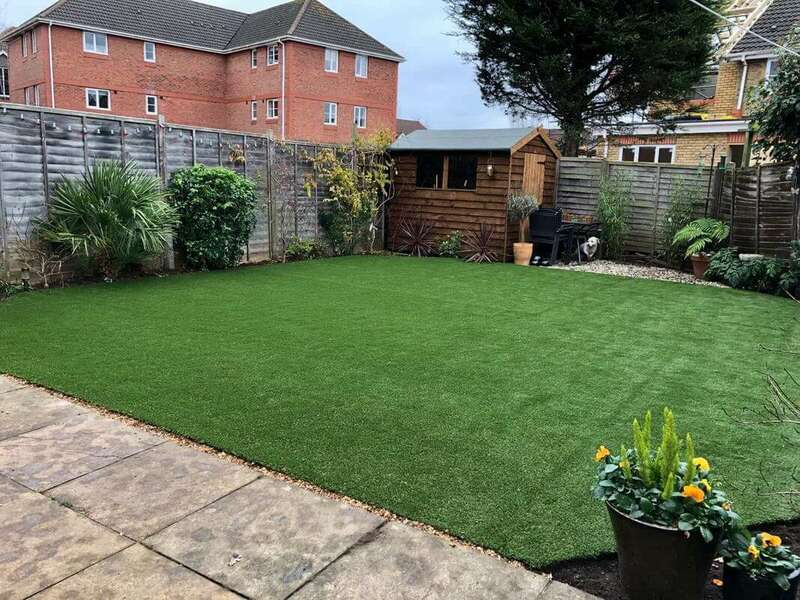 Our client was fed up with his patchy lawn and pondering a move, so asked us to sharpen up his garden with a new artificial lawn. He decided on a Namgrass Elise lawn with grey block edge. We levelled the area and completed the fitting. The results look great. 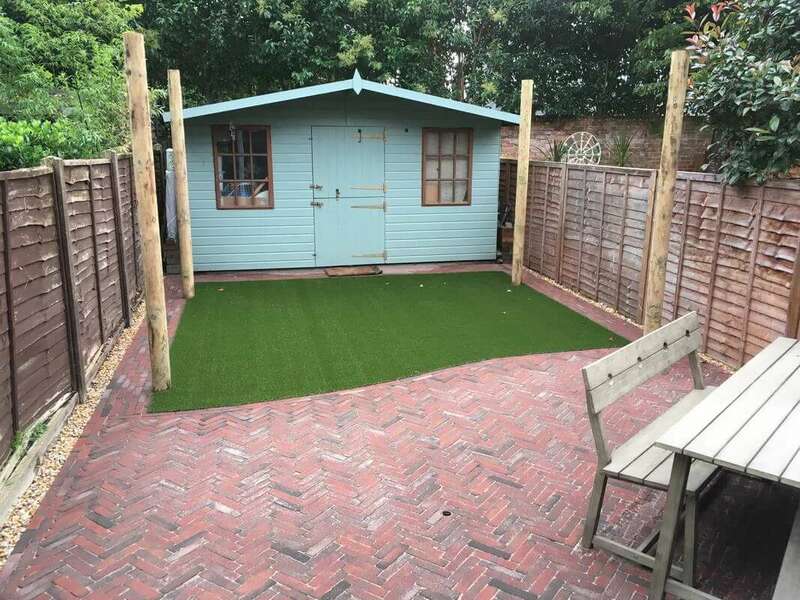 Artificial Lawn fitted with Herringbone effect Clay Block Paved Patio. 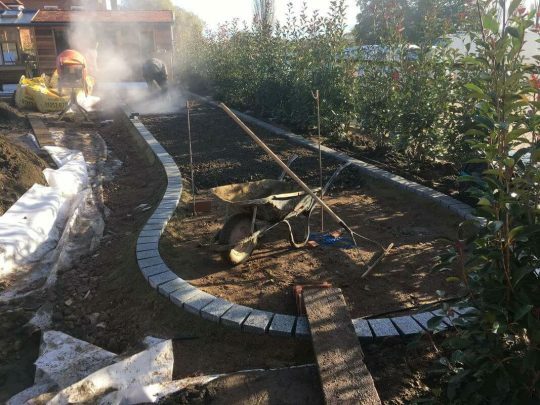 Our client asked us to tidy up his rear garden, but to match the paved area to the traditional blocks outside the front of his property. 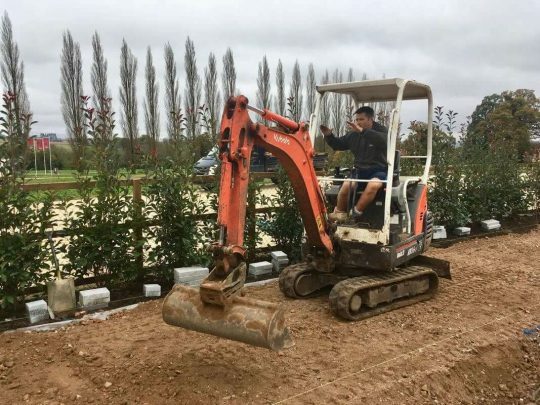 He had picked the products he wanted to use already, so that just left us to drive the digger through a few gardens to gain access and then work our magic with a sharply designed finish. The contrast of the clay blocks and bright Namgrass Elise lawn looks fantastic! Artificial Lawn and Sandstone Patio with Edging Fitted, plus raised Sleeper beds. 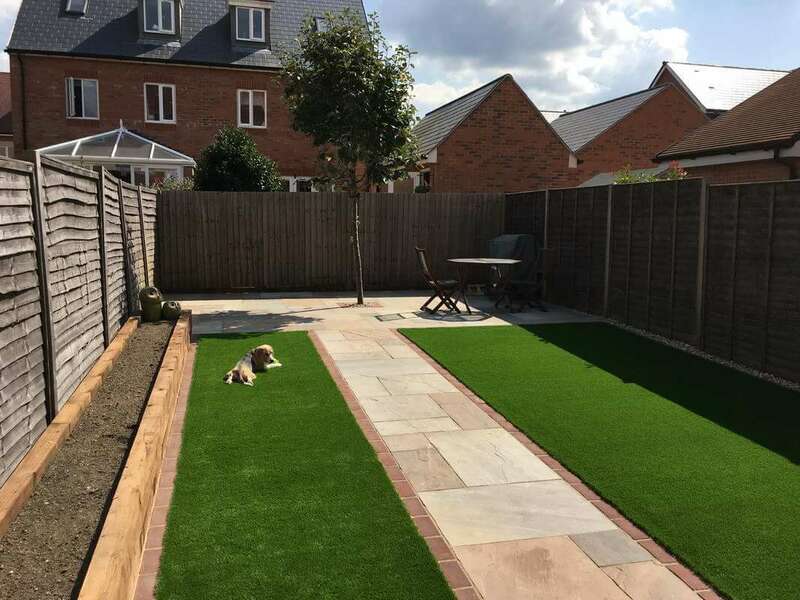 Our clients asked us to create a low maintenance / pet friendly rear garden for them to enjoy with the dogs. 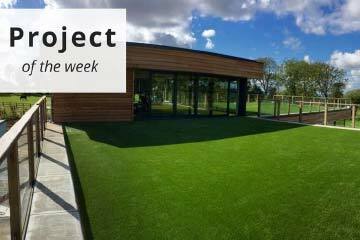 We fitted 2 sections of bright B2B35 artificial Lawn with a Lakeland Sandstone Patio, paths and a Sleeper bed on the left hand side. They are delighted and the pictures of the dogs speak for themselves!